Travel posts are over for awhile now – back to San Diego stuff! 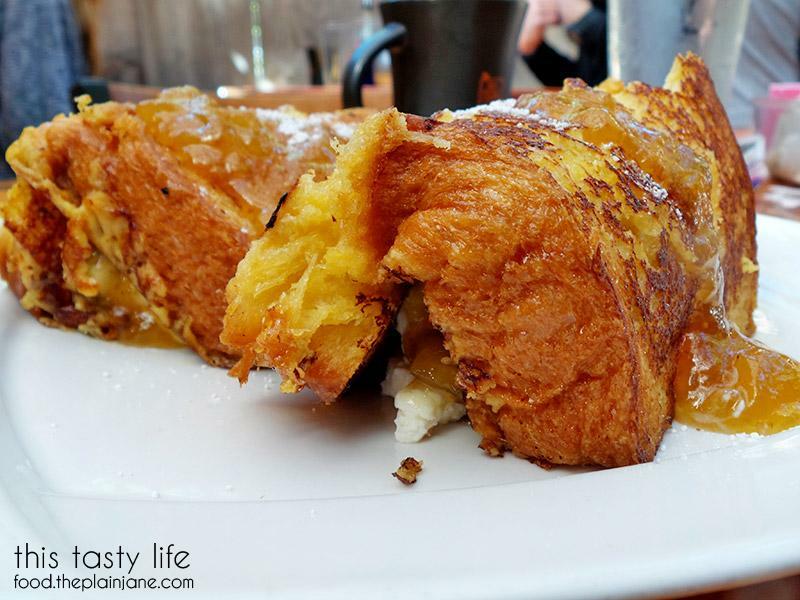 Over the week we checked out another breakfast spot – because helloooo – I love breakfast! Jake, T, Maya and I were running an errand near Pacific Beach. I actually wanted to go to Leilani’s Cafe but their credit card machine was down and they were only accepting cash. I didn’t have enough to cover breakfast so we ended up going next door to the Fig Tree Cafe. 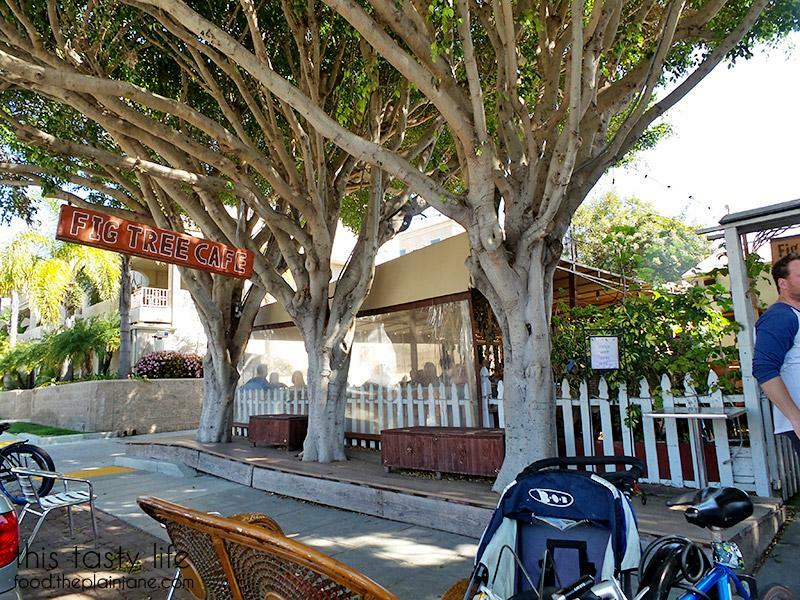 The Pacific Beach location is the original spot for the Fig Tree Cafe, which has now expanded to Hillcrest and Liberty Station (with a new location coming soon to Little Italy). I got us a table and I immediately felt like I was in a treehouse in the jungle just walking through the restaurant. 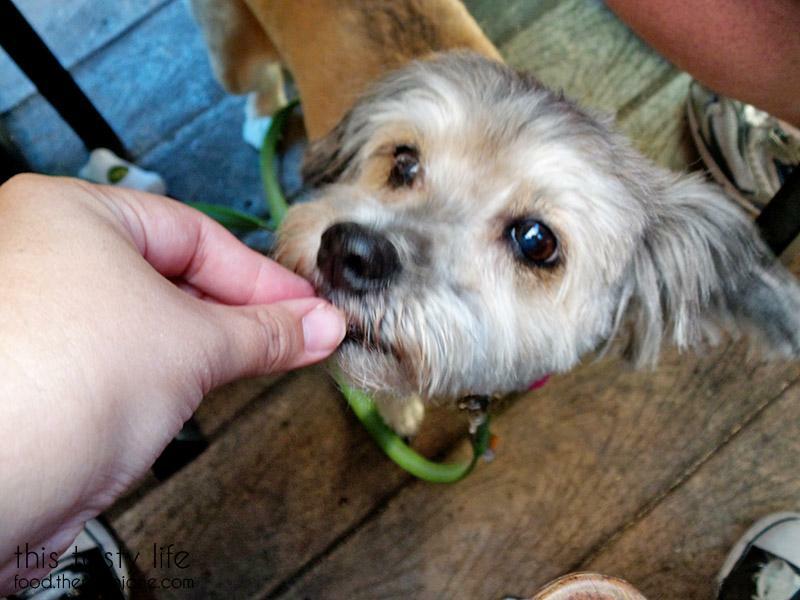 All of the tables at Fig Tree Cafe are outdoors (and dog friendly)! I loved this rustic looking table top sitting on wood barrels near the front of the restaurant. This is a great area for a large party. The hostess lead us back to this little table which was the perfect little spot. Our waitress told us the owner handmade the tabletops which was cool. There’s a bar in the center of the restaurant (behind T). There’s a trellis covering the whole patio. There was lots of shade all around the restaurant so no one really has to sit in direct sunlight (except for a few spots here and there). It felt very cozy and treehouse-like out here. I loved the look and feel of this location of the Fig Tree Cafe. I had a coupon in the Entertainment coupon book for the Fig Tree Cafe but our waitress informed us it was only good Monday through Friday… which made it a useless coupon to us. Bummer. They have a “Caffeine Sampler” which amused me. If you can’t decide on a coffee, the sampler will get you 4 ounces of a latte, mocha, and Mexican mocha with your choice of milk. I stuck with a regular cup of joe. Apparently I got the oldest menu ever. It was yellowing and all torn apart. Maybe time to toss this one out? 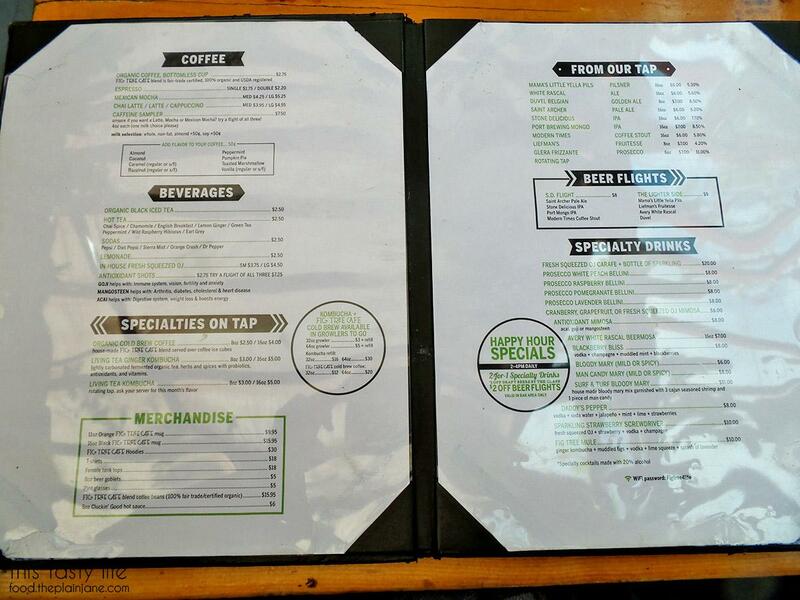 The menu is also available over on their website. After getting a few suggestions from our very helpful and friendly waitress, we agreed on a few items to share between the three of us. 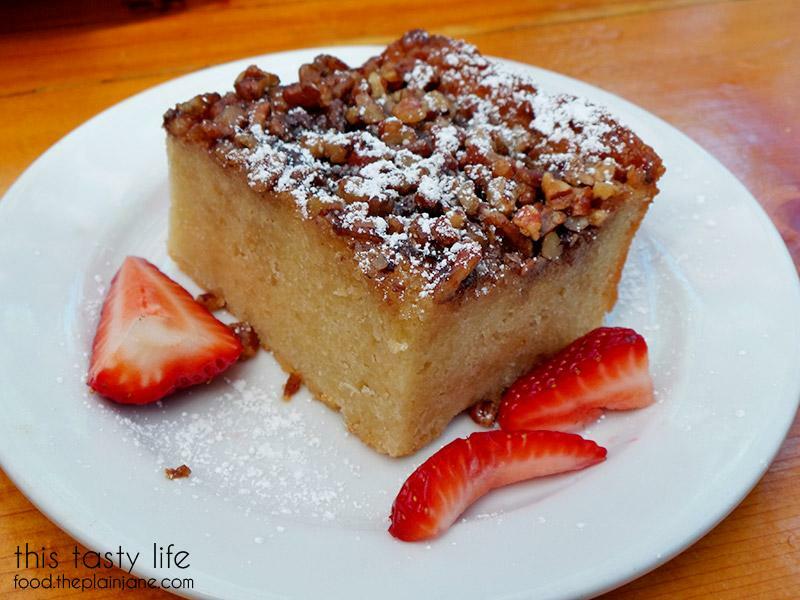 I spied coffee cake on the menu and had to try it. 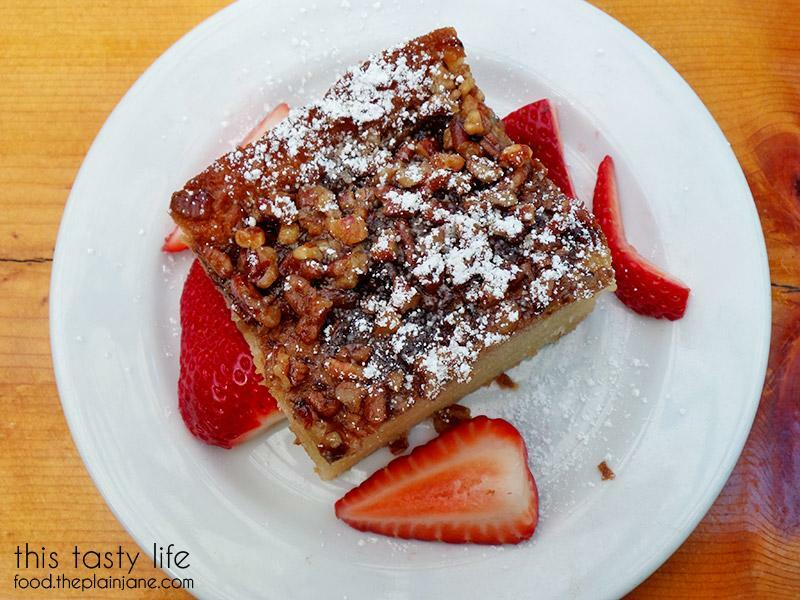 Coffee cake is something I love – it’s pretty much like eating cake for breakfast! I was hoping the coffee cake would come out first, but it arrived with the rest of our food. The coffee cake is served at room temperature. It had a pretty top with the little dusting of powdered sugar and chopped nuts on top. And while the coffee cake looked pretty, there was something lacking about this coffee cake. The crumb on the cake was a bit off – it tasted dense, a bit oily, and was on the bland side. It didn’t have a fluffy cake texture and the denseness of it just weighed it down. It wasn’t the “cake for breakfast!” slice that I was hoping for since it had very little flavor. We ate it anyway but it was very underwhelming and not something I would order again. We also got a side of Louisiana Sausage. The presentation on this one was uh.. a bit lacking. It was served on a plate by itself, which was fine, but the entire plate was full of grease which was kind of off-putting. 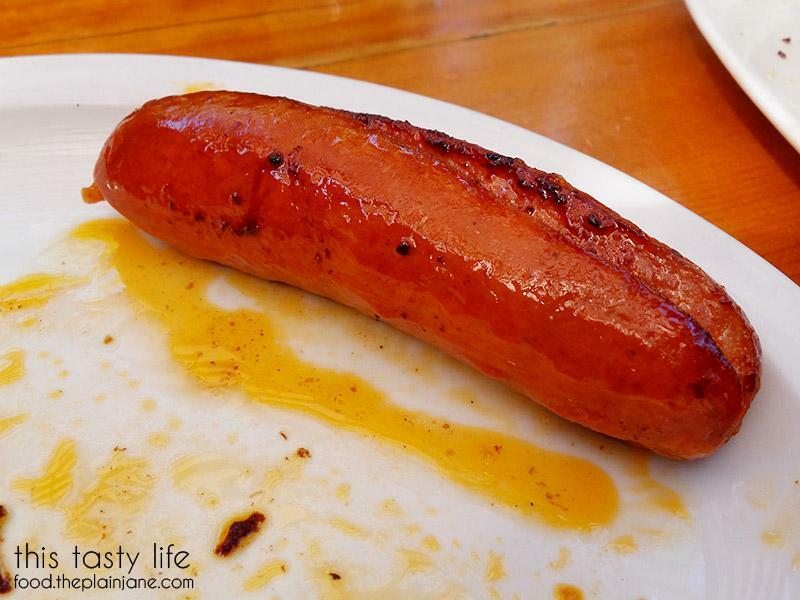 I was also hoping that the sausage would come with a little bit more color from getting warmed up on the grill. The flavor wasn’t bad – it had a slightly spicy flavor and the texture was okay – I just felt it could have used a little more attention to get properly heated up. Jake also commented that this (and all of the food) was served a bit on the cold side. At least Maya enjoyed bits of that sausage! I was in an Eggs Benedict kind of mood and decided to go with their straight “traditional” benedict with Canadian bacon. You could choose either an English muffin or house made foccacia bread and I went with the traditional English muffin. For $2 extra bucks, you can “upgrade” your potatoes to have arugula, truffle oil, and Parmesan but I passed on the upgrade. Presentation is the first thing you really look at when a plate of food is set before you and this plate was lacking in a nice presentation. The eggs are kind of slopped on the plate and also the plate was kind of dirty and speckled… Jake said it was because the server was stacking the plates on top of each other but this little lack of detail made me a little sad. First off… the potatoes. The potatoes had no flavor. At all. Not even a hint of salt or pepper! They just tasted like plain cooked potatoes. They were at least cooked all the way through but they did nothing to inspire my tastebuds. I added a hefty amount of salt and pepper to pep them up but I left them mostly untouched. Jake ended up drowning them in ketchup to finish them off. Maybe I should have upgraded the potatoes after all. 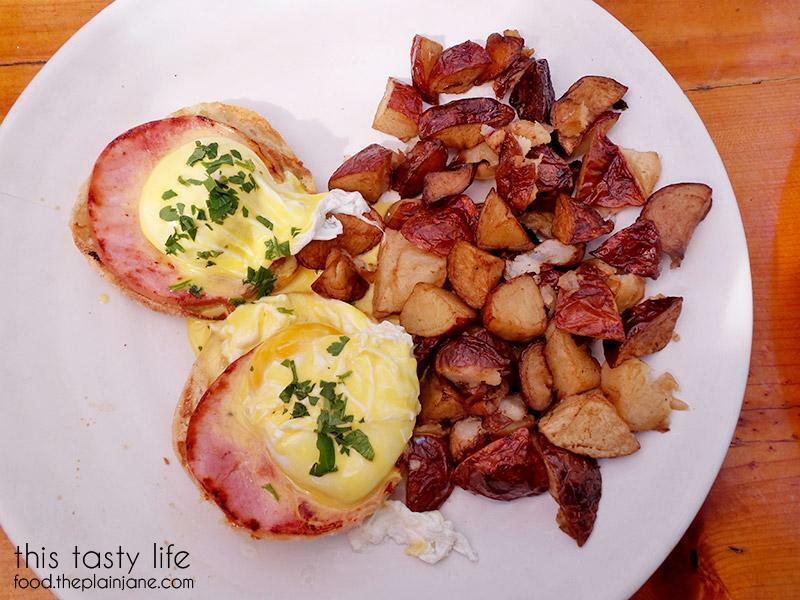 The eggs benedict was just… okay. The hollandaise sauce was a little on the bitter side. 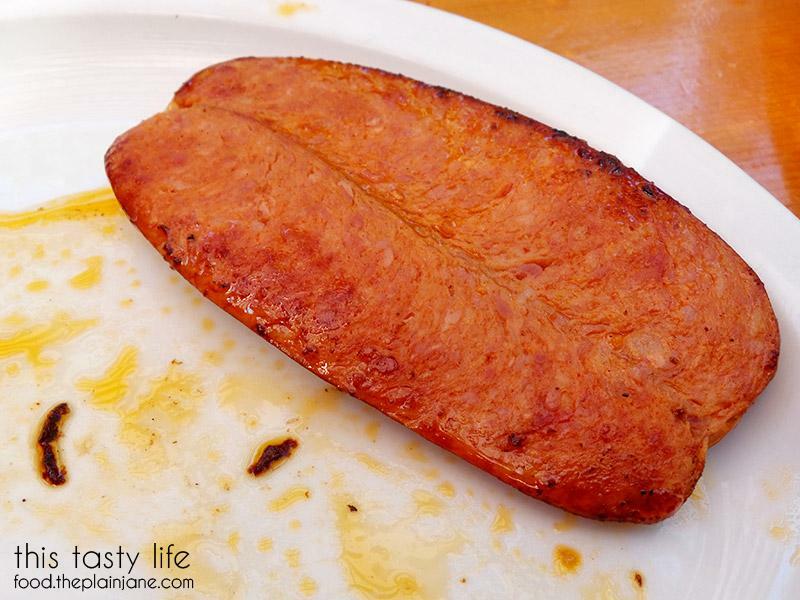 The Canadian bacon was a bit tough to chew through. It didn’t help that it was a little on the cold side, either. It was just a really “meh” dish. I’ve had much better and I’ve also had much worse. 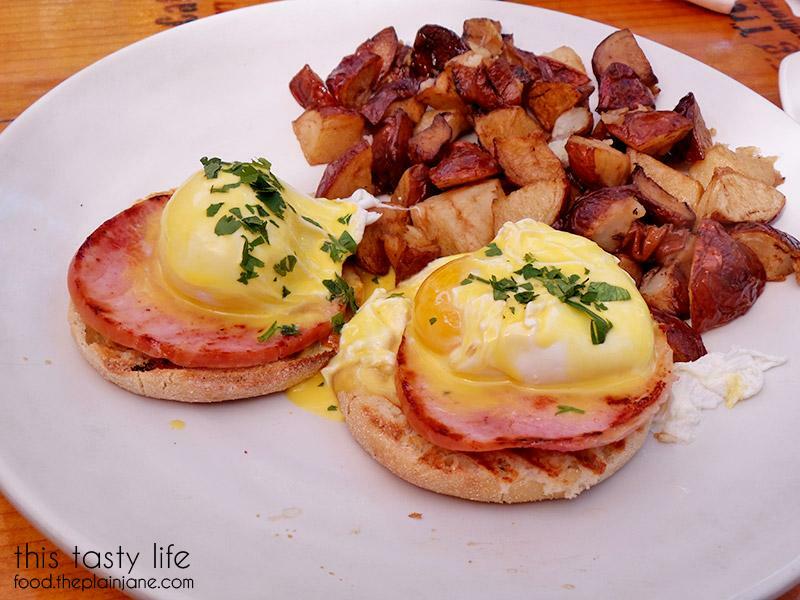 Very “middle of the road” eggs benedict. 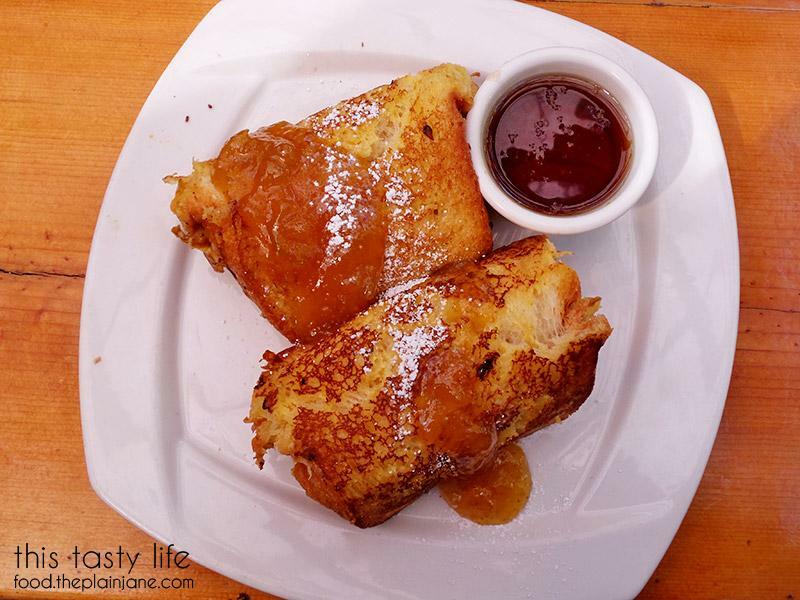 The saving grace for our meal was the sweet item that we ordered – a French toast stuffed with ricotta cheese and topped with fig jam. This dish was the perfect amount of sweetness from the French toast and the fig jam. It didn’t need the additional maple syrup at all! The French toast was very good – the bread had a nice eggy-custard taste and the bits of creamy ricotta really put it over the top. The fig jam was the perfect sweet compliment to the dish providing a boost of flavor and sweetness without overpowering the dish. I had one bite with maple syrup and found that I didn’t like it with maple syrup – it made it just a little too sweet. The ricotta was my favorite part about this dish – it was so smooth and creamy and tasted wonderful with the pieces of French toast. All in all I was disappointed with this meal except for the French toast. The lack of details made me feel like something was missing back there in the kitchen and that the love is getting a bit lost. 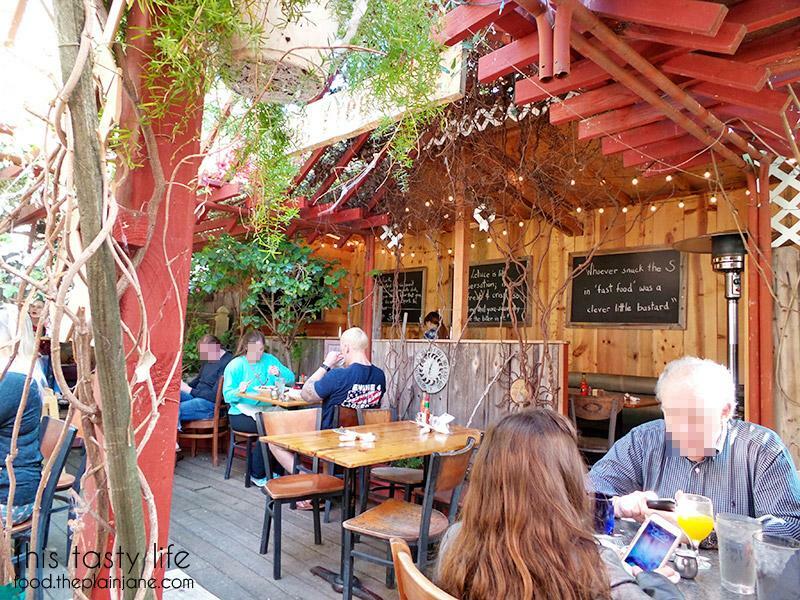 I loved the location and the cool outdoor-treehouse feel and the service we had was excellent. But when the food doesn’t rise to the occasion it makes me wonder if a repeat visit is worth the effort. California Through My Lens visited the Liberty Station location in December of 2015. 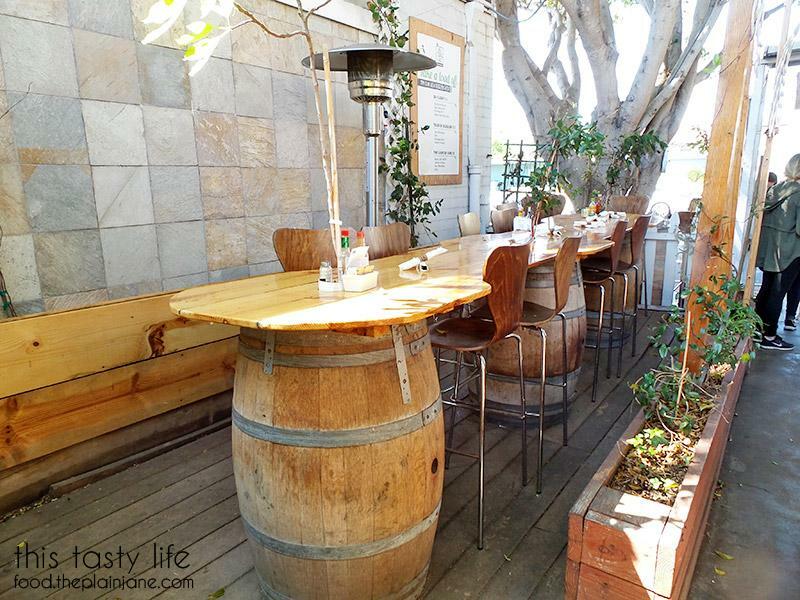 Minion visited the Hillcrest location of Fig Tree Cafe in March of 2015. 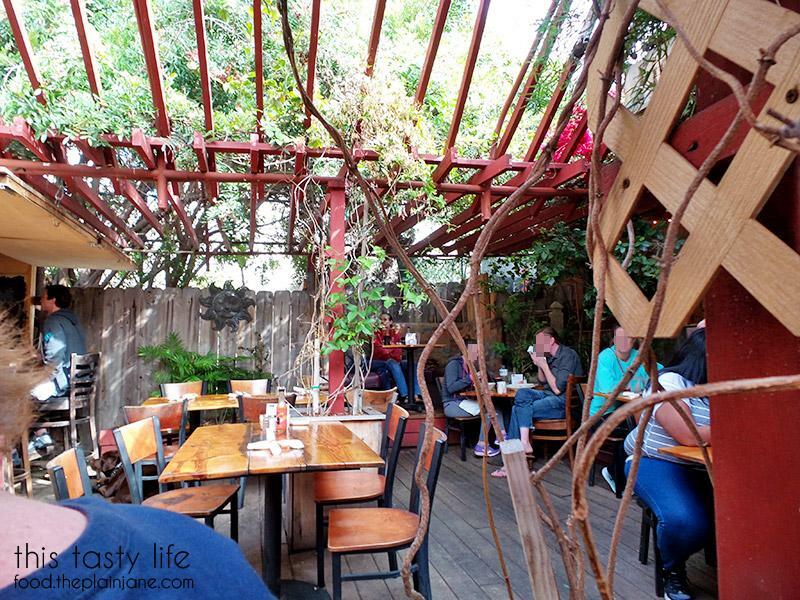 The OB Rag wrote a little post about Fig Tree Cafe back in December of 2014. 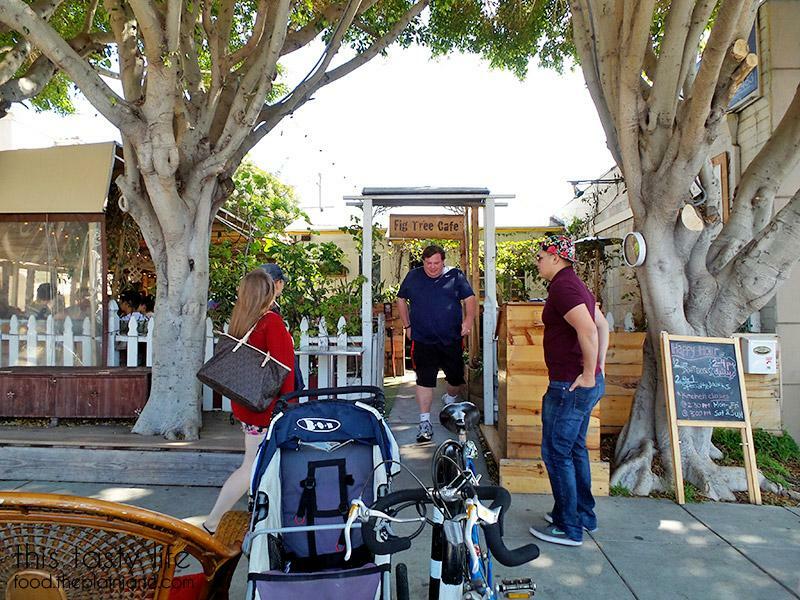 Discover San Diego did an article about co-owner Johan Engman in July of 2014. Janice from Food is my Favorite also checked out the Liberty Station location in 2014. 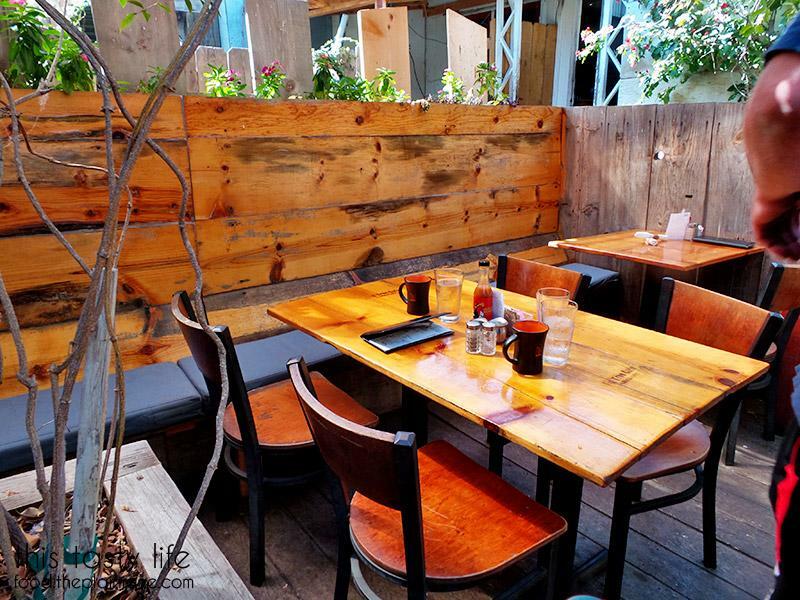 Jinxi of Jinxi Eats did a post about the Pacific Beach location way back in 2013. One of my friends charmed the waiter at the Hillcrest location and got a free french toast! I don’t think that happens all the time though, ha ha. We went there because the line at Snooze was waaaay too long and it was 90 degrees and we didn’t want to stand out in the heat. Bert and I went to the Liberty Station location intending to use a coupon but found it was not valid on weekends, so poo. But we still ate there anyways. It’s on the noisy side if you eat out on the patio (lots of planes flying overhead every five minutes it seemed). I still would like to try the PB location. Hi CC – Dannnnng, what a charmer! I have never charmed anyone enough to give me free french toast hahah. Snooze does have a silly long wait – but if you go before 8AM then you should be good (hah). Yeah, I was bummed about the “no weekend” aspect of the coupon which made it a useless coupon for me since I’m always working on the weekdays. 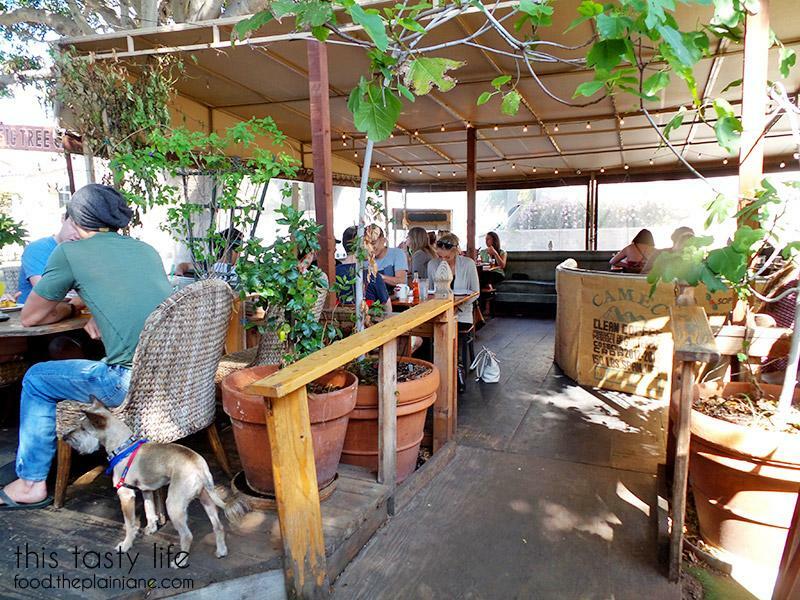 The PB location is very cool and pretty and I loved how dog friendly it was. sorry to hear about the majority of ‘blah’ from your visit. i haven’t been to one of these in a while. I remember minion’s post last year where I mentioned having a not-so-good experience at the pb location. i’m over it though and too lazy to post. i do want to start writing about breakfast places though! i need to find me a good spot to satisfy my cravings! Hi Lynn – Going back and doing the links for this place it seemed a lot of the reviews thought it was pretty “blah” here as well… so at least it’s not just me that feels that way! I think a little attention to detail and serving hot food would go a long way to improve things here. 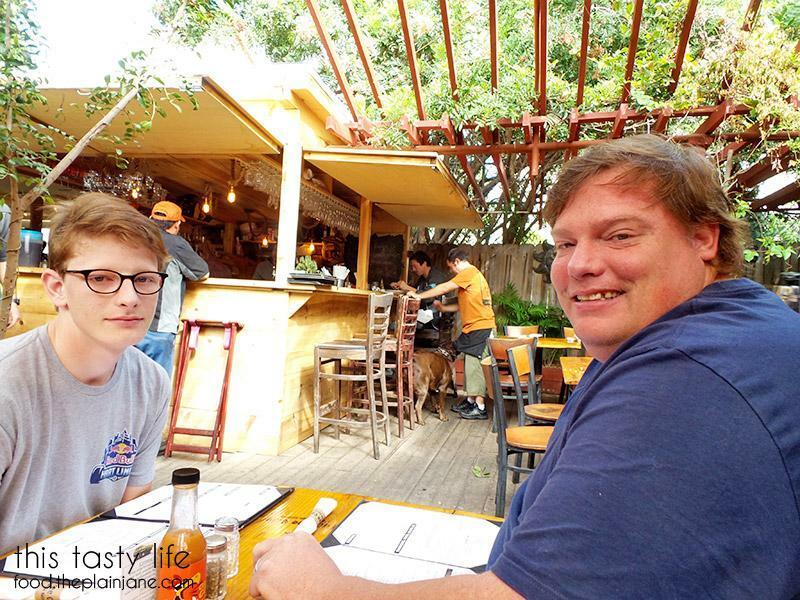 I’ve been loving going out for breakfast on the weekends – there are lots of cool places to check out! Hi Soo – Salt, pepper, seasoning of any kind really… I like that on ALL of my food, haha. I’ll definitely have to try adding a little ricotta to my homemade breakfasts in the future! Thanks for the link love! I really enjoyed Fig Tree Cafe and the one you visited looks like it has a really fun style/atmosphere that makes me want to go to that one as well! Hi Josh – Thanks for stopping by! The Pacific Beach location is very lovely! Yes! I love finding dog friendly spots around town since my dog loves coming out with me. The French Toast here was the best thing, hands down. 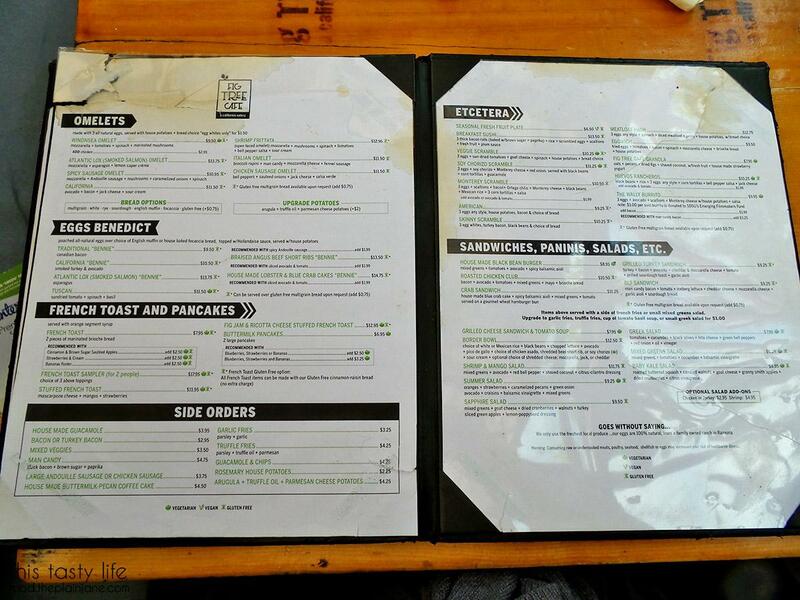 I love the treehouse-feel of Fig Tree but wish they would improve on some of their other items!